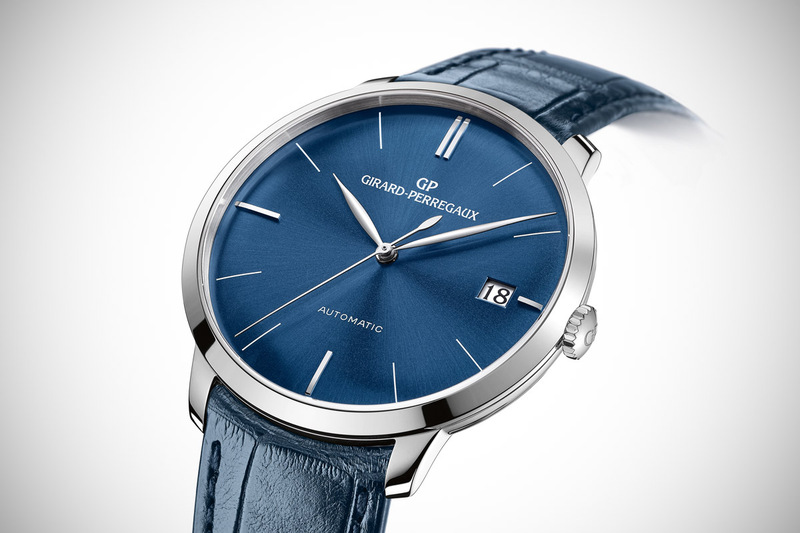 The Girard-Perregaux 1966 blue dial is clearly the quintessential dress watch – so of course, we loved it. This was the case when we saw the first preview before Baselworld and the same goes after a few weeks on the wrist. 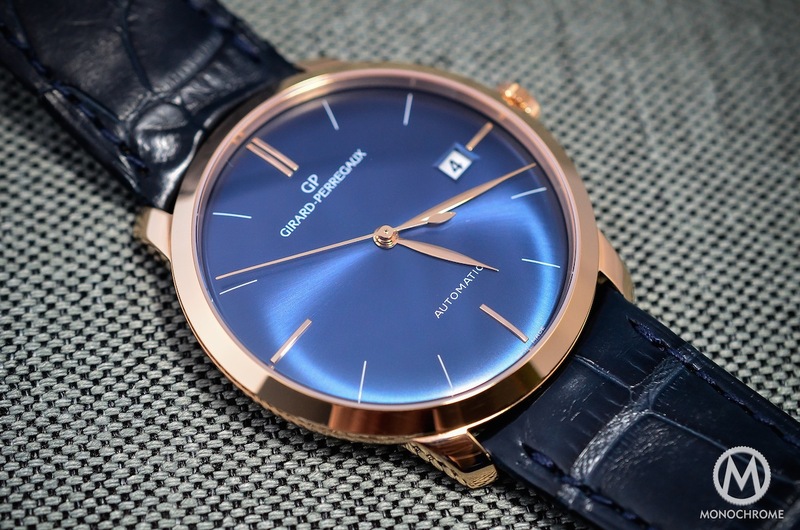 Now that you know our feelings on this blue dial and pink gold edition of the 1966, you have to know the reasons that led us to this conclusion, as well as the strengths and also weaknesses of Girard-Perregaux last release (because, yes, it also has a scant few imperfections). Or at least, what are we expecting from a dress watch? 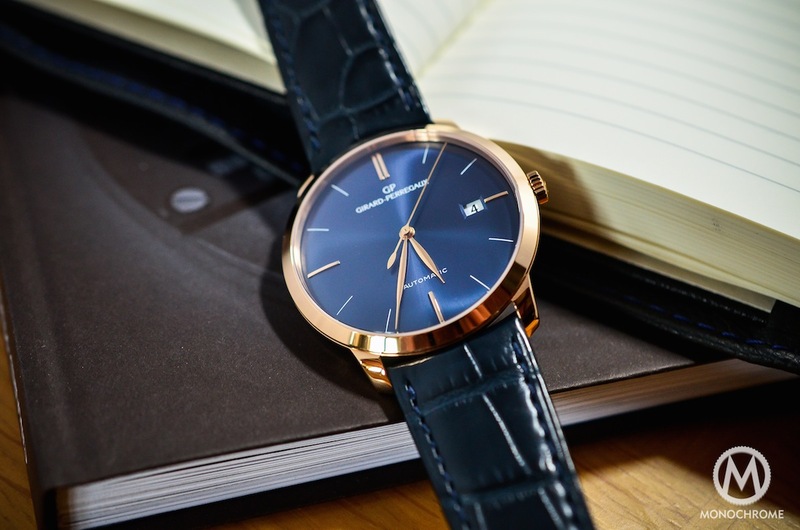 The usual consensus, when asking several people, will lead you to any simple, discreet and elegant watch that would fit a suit-and-tie dress code. First of all, it has to be simple and classical. Not that we don’t like people who wear a Hautlence HL Ti 2 or an MB&F Moonmachine with a tuxedo, but in the collective psyche, a dress watch has to be discreet and elegant – meaning a rather small and conservative timepiece. It also has to be thin enough to fit under your cuffs. Last specification: a precious material, such as gold or platinum, is usually preferred. 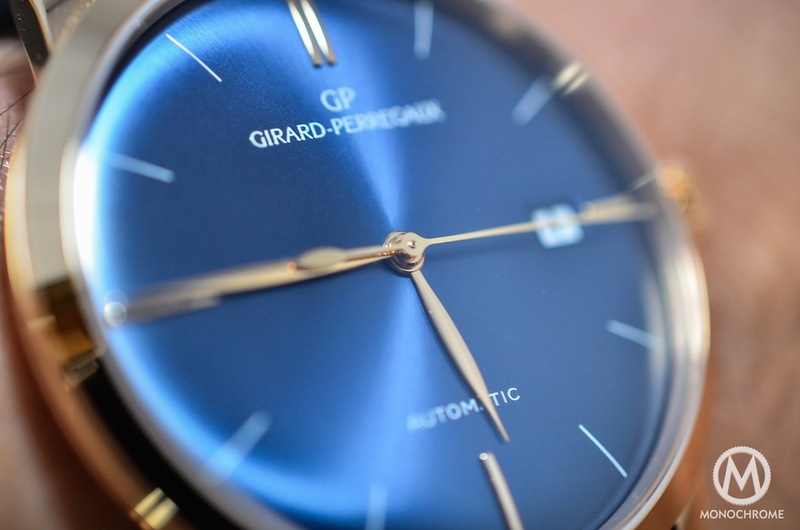 Now that our parameters are clear, and after the Girard-Perregaux blue dial survived the hard life of a watch editor for several weeks, let’s run it through the rigors of these more honed ‘requirements’. 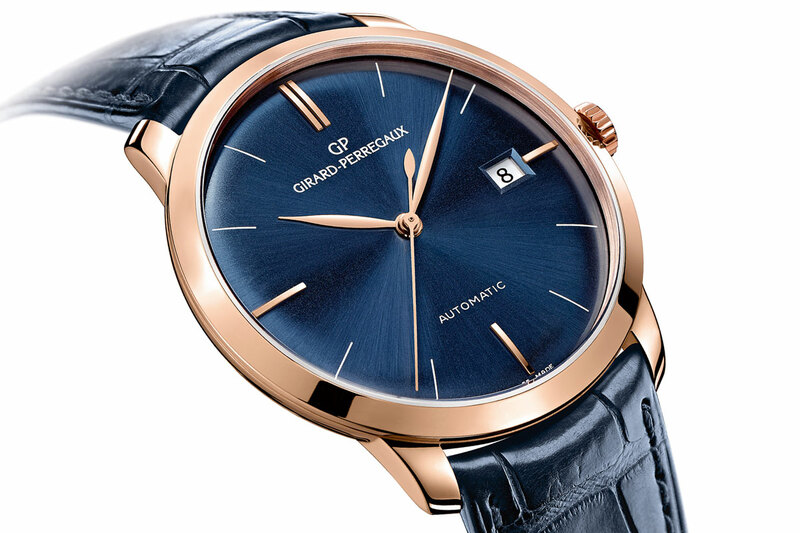 The first thing that you’ll notice when looking at the 1966 blue dial is (surprisingly…) its dial. 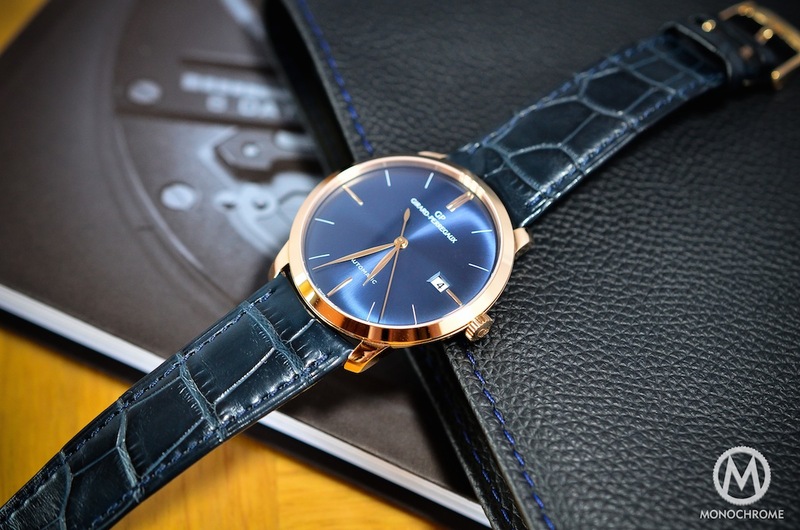 Its main strength is clearly the combination of that blue tint and the soft color of the pink gold case, all juxtaposed with a deep blue strap. The 1966, whatever the edition, is an elegant, simple and classical dress watch. When comparing to our ‘requirements’, it fits every of them: size, thickness, legibility and comfort are part of the package offered here. We already showed you the small second version with an off-white dial, the 41mm case edition with a white dial and the very complicated and desirable 1966 minute repeater, equation of time and annual calendar. This newly introduced 1966 blue dial shares the exact same design codes – the case, lugs, indexes and hands are identical – but it adds something more, a touch of eccentricity subtle enough to keep its status of dress watch. As with many (if not most) dress watches, the 1966 does not feature any displayed complications. However, this is not a simple watch as it brings several technical features to the table, all of which we’ll explain to you later in the ‘movement’ section. The dial only shows the hours and minutes, and, luckily, the seconds (not that the lattermost is essential, but it enlivens the dial with its constant movement). You’ll also see a date, unfortunately with a white disc that pops out in the middle of the dial. You’ll find all the vital indications that are useful in 99% of day-to-day situations. The hands first. Made of the same material as the case, 18K pink gold, the hour and minute hands present a very classical yet elegant leaf design, with a polished finish. Same goes for the second hand but with a straight shape and a rounded counterweight. The indexes, according to their place on the dial, show several design. The 12 index is a double baton shape in applied pink gold and the quarters are simple batons also in applied pink gold. All the other indexes are simple, thin lines painted in white. The only inscriptions you’ll find on the dial are the name of the brand at 12 and ‘automatic’ at 6. The latter could easily be removed to simplify the dial. 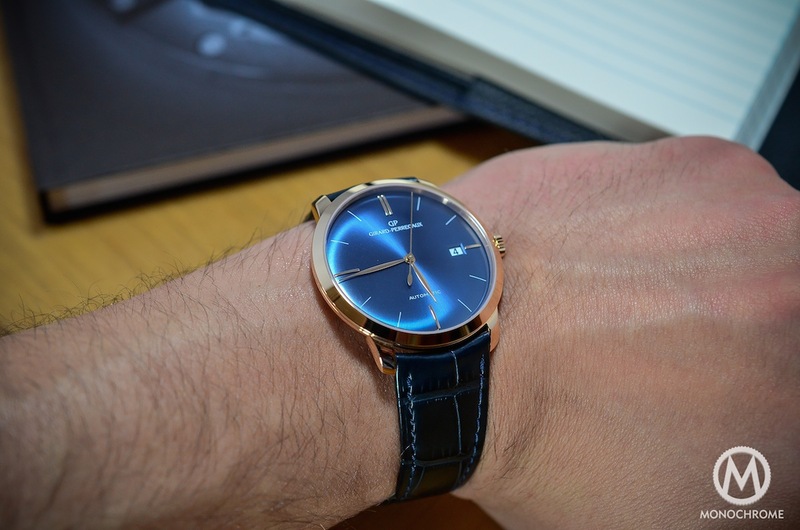 The dial itself shows a very nice, deep shade of blue. 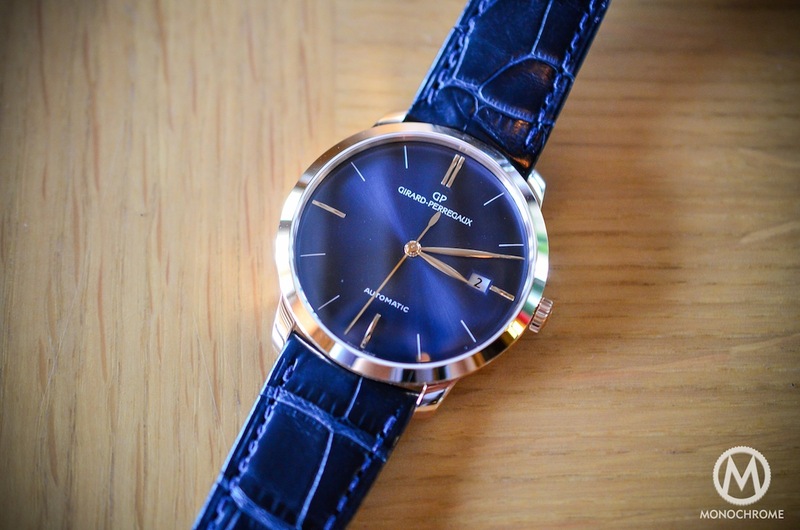 Blue watches were one of the main trends of Baselworld, both this year and in 2013. However, it is not as simple as it seems to obtain a beautiful blue color. 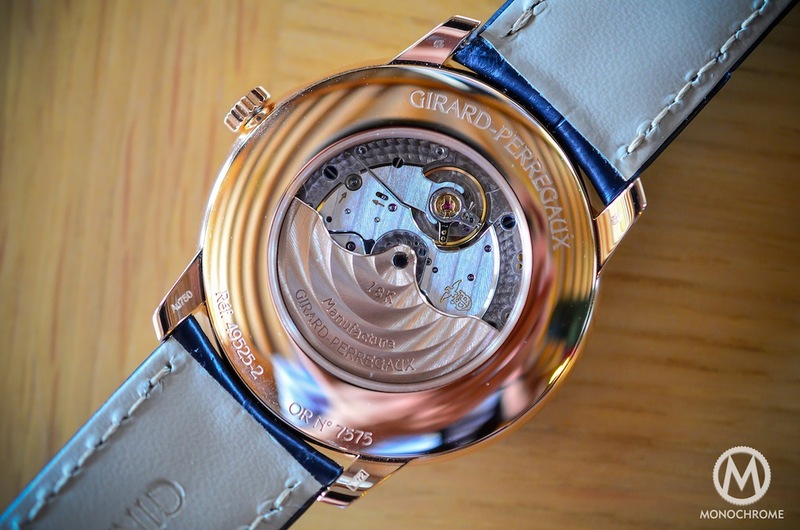 If the dial is plain, without graining or guilloche, a blue dial is often dreary and lifeless. Even the search for the right shade of blue can be difficult. 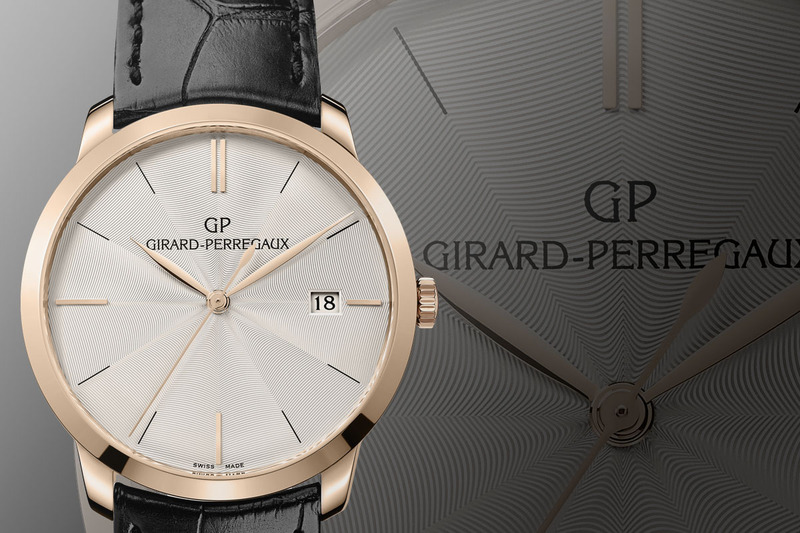 Girard-Perregaux did pretty well with this 1966. First, the color is deep, rich and exactly where it has to be, between a too light and therefore sporty blue, and a too dark and boring marine. Then, the dial presents a sunburst finish and a slightly domed shape that give, according to lighting conditions, some very nice reflections. 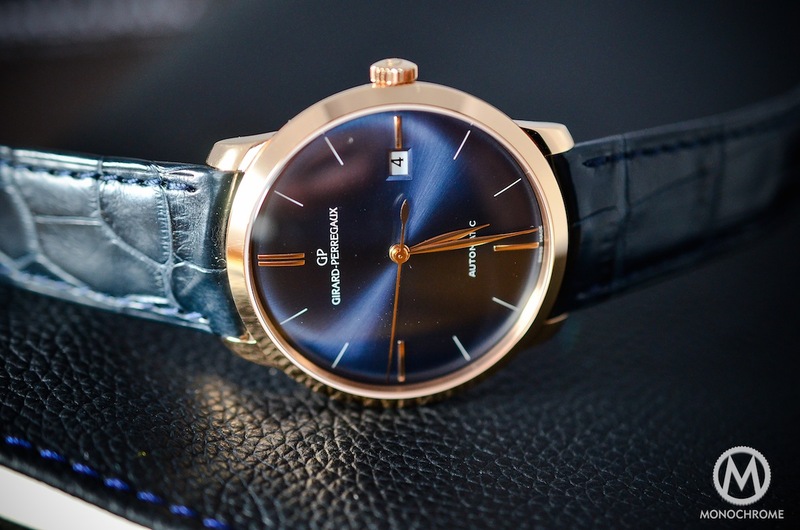 Last but not least, that blue dial perfectly complements the pink gold case. The case is made of 18k pink gold with a very soft color, non at all aggressive or ostentatious – It may sound odd, but every gold has a different color, depending on the components and their proportions in the alloy. Every pink gold will be different from another. Here we have a nice and discreet shade of gold, mirror polished on every part and very well executed. 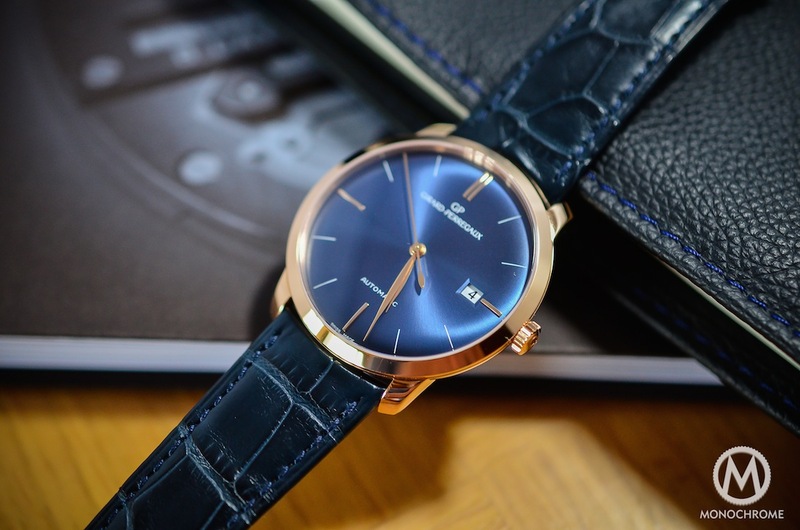 The case measures 38mm, a size that we believe to be totally appropriate for a dress watch. 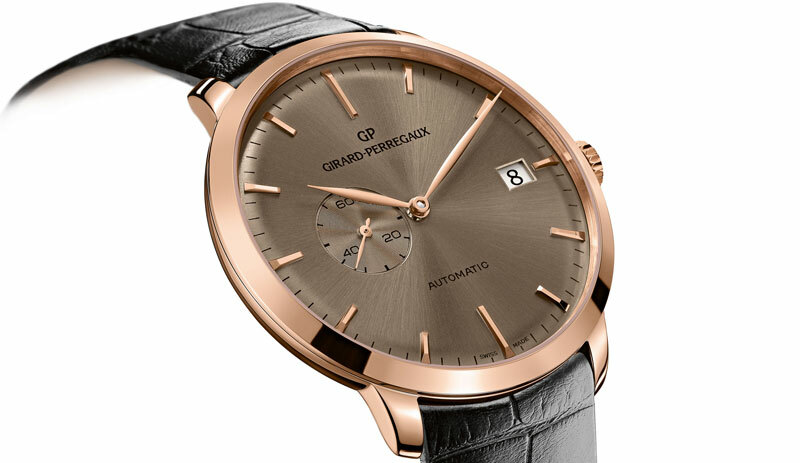 The sides of the Girard-Perregaux 1966 are concave and round, giving the impression that the watch is slimmer than it is. The 1966 is thin, at approximately 10mm thick, but not extra-thin. The shape of the case and the bevelled bezel accentuates this ‘slim effect’. 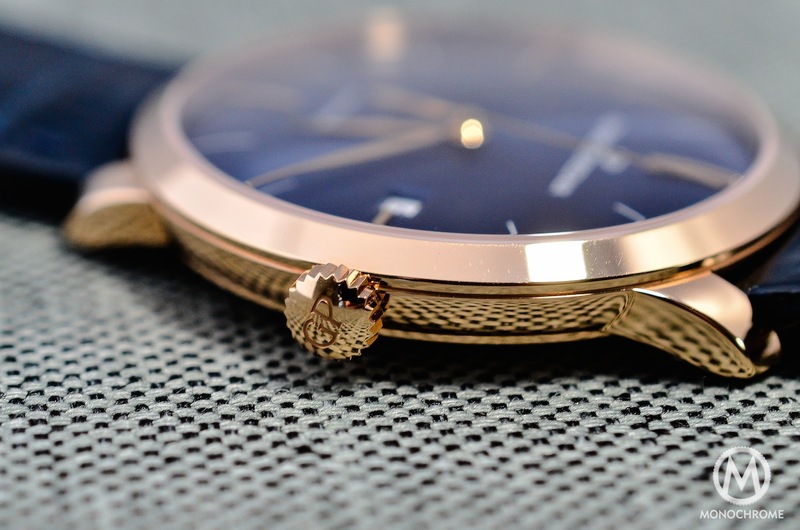 The watch comes with sapphire crystals on both the top (where it is a domed crystal) and on the caseback, to allow a view of the nicely finished movement. 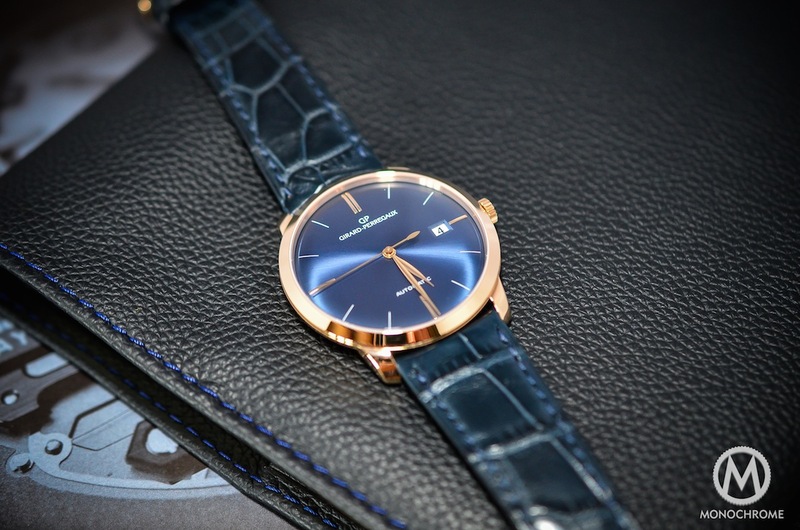 The strap is made of blue alligator with matching stitching and features a pin-buckle in 18k pink gold. The deep blue color of the strap matches the dial really well, and its slightly glossy finish gives a dressed feeling to the whole watch. The watch comes with the self-winding Calibre GP-3300, an in-house movement known to be both reliable and nicely executed. It is also used as a base to power several MB&F and their display complications, such as the HM3 Frog or the HM5. Considering the power required to drive such displays, rest assured that it will have no problem driving only classical hands. It is a modern movement that ticks at 28.800vph (4Hz) and features useful technologies, such as quick date – meaning that the date will change instantaneously at 12 and that you can set it directly from the first position of the crown, without changing time – and a hacking second mechanism, allowing the movement to stop when the crown is pulled out in order to finely adjust time. It boasts 46 hours of power reserve. 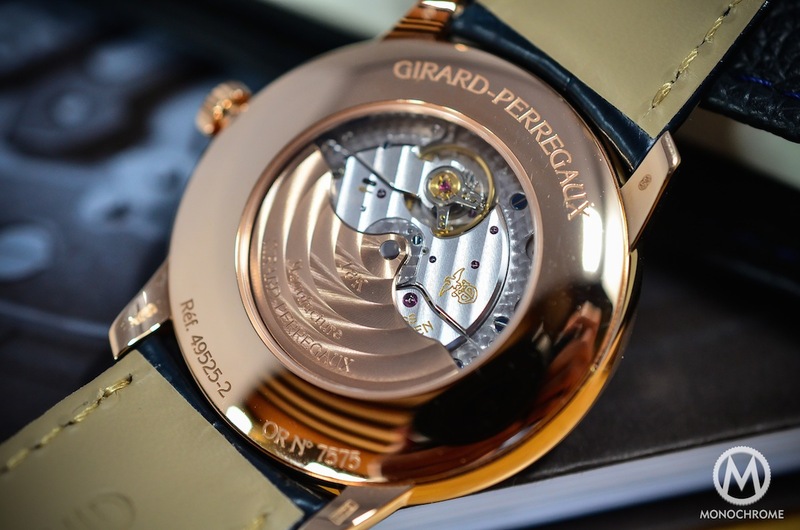 The finish of the movement is also quite interesting as it comes with an 18k gold rotor adorned with circular Geneva stripes. The bridges are finished with straight Geneva stripes and hand-polished bevelled angles. 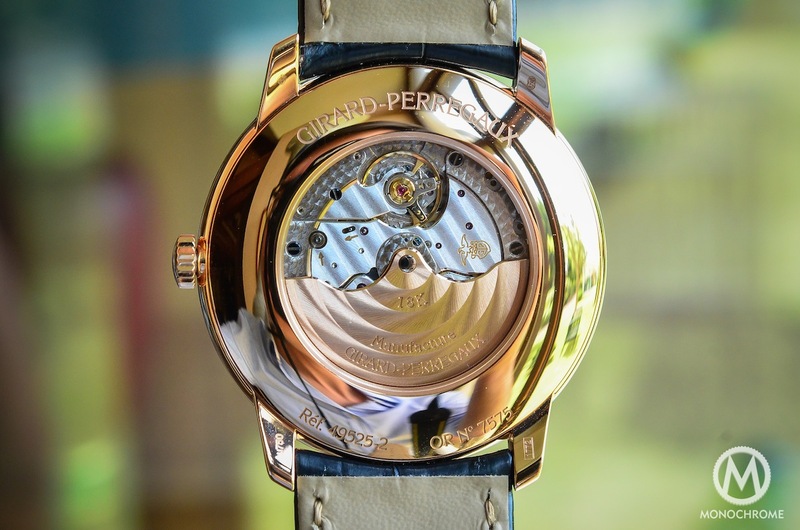 The main plate of the movement is adorned with a very fine circular graining. 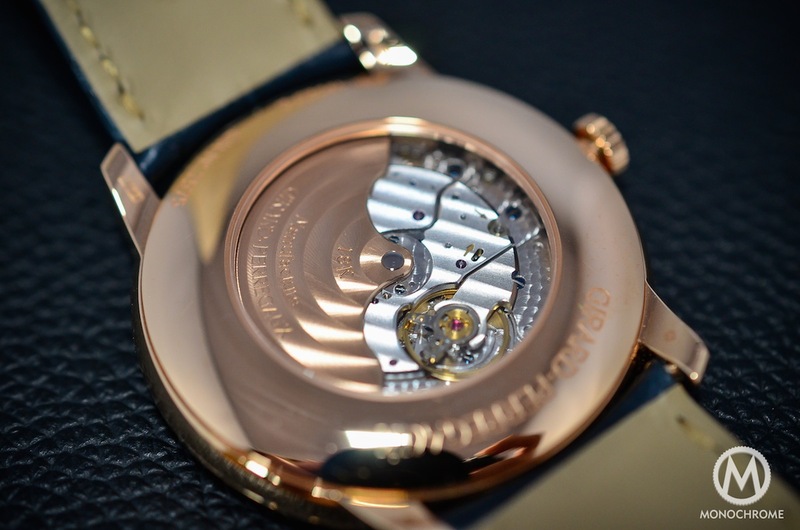 This movement is very pleasant to look at but its main drawback is its size – 25,6mm. It is clearly undersized for a 38mm watch. The movement feels a bit lost in the case. 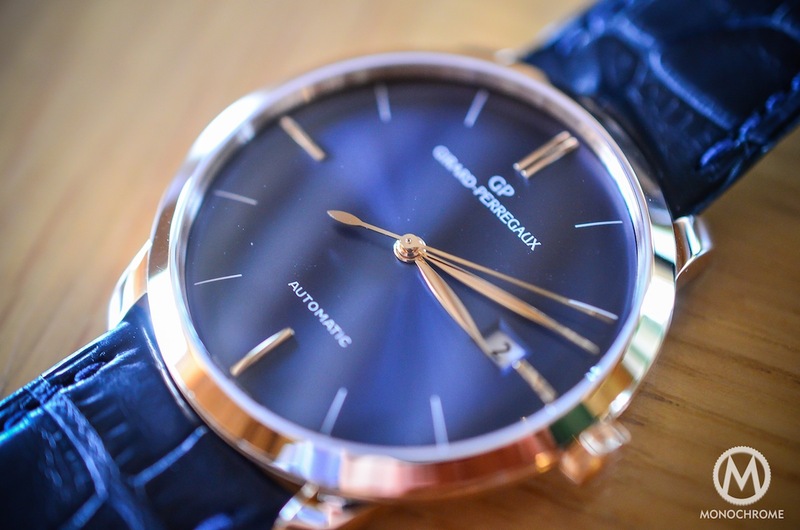 The Girard-Perregaux blue dial is really comfortable and will fit every wrist. The 38mm are great and the watch doesn’t suffer of such a size. The blue dial and strap, combined with the pink gold case, holds the attention of the wearer as well as that of everyone he encounters. Not that the watch is showy, but people do take a real pleasure in looking at it. The color combination also allows you to wear it both on a casual occasion, with a nice shirt and good old pair of jeans or with a business suit. 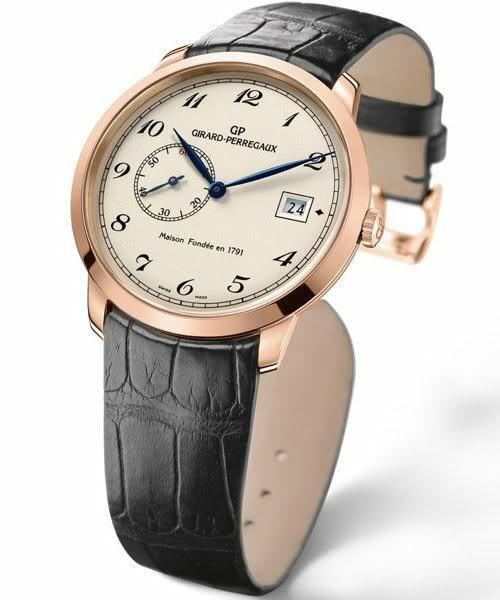 The GP 1966 is a great watch that we loved wearing. 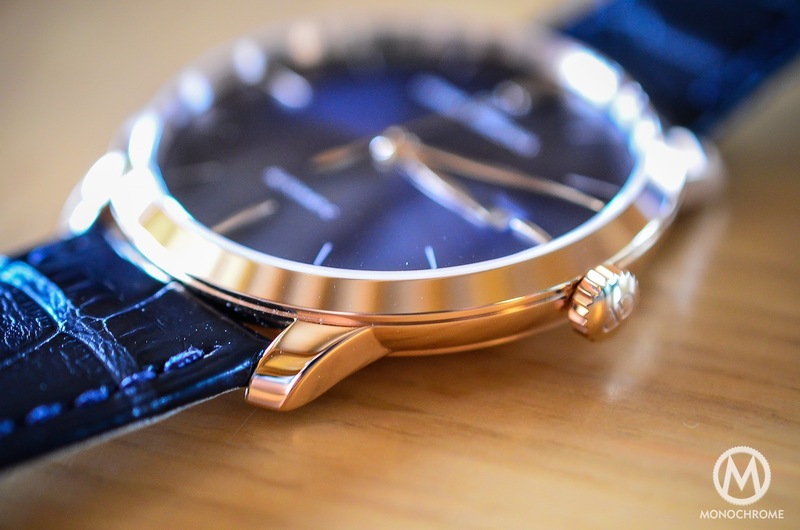 It is a technically simple 3 hands watch that boasts an interesting and very well finished in-house movement. But it’s not the only one on the market. Its main competitors are the Rolex Cellini Date introduced in Baselworld this year, the Jaeger-Lecoultre Master Control or the H. Moser & Cie. Venturer Small Second. All of them retail for approximately the same price, with an equal level of quality and an in-house movement in all cases. What the GP adds is a very subtle touch of eccentricity that makes all the difference. 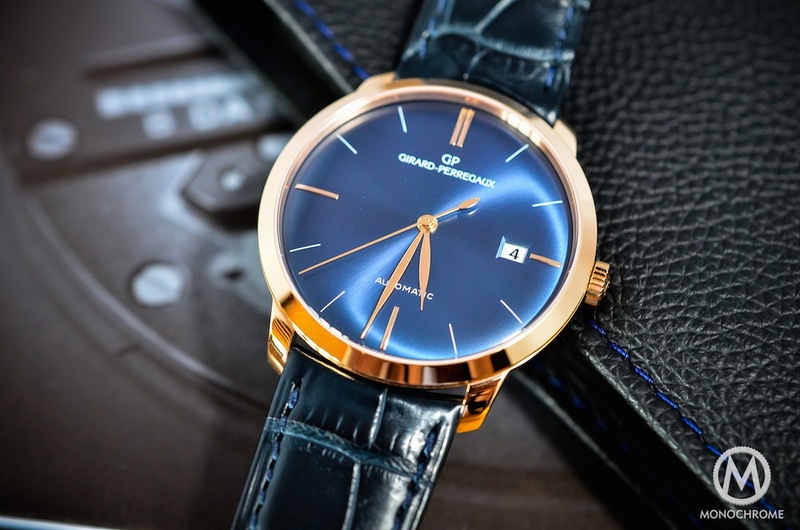 The Girard-Perregaux 1966 blue dial is priced at € 13.450-Eur. 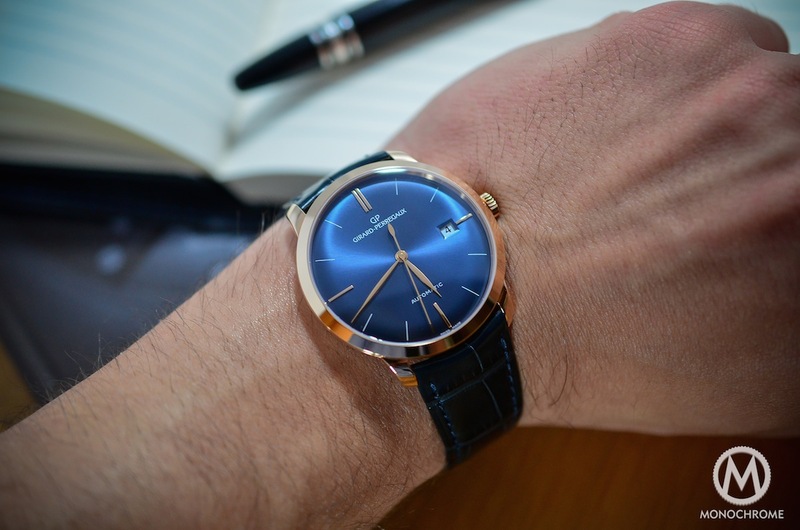 where do I purchase this Girard-pevvegaux,66 blue dail, pink gold watch? I bought this watch shortly after reading this review and I highly recommend it. I traded in/up a jlc master control ultra-thin, and I believe this is a superior watch to the JLC in many ways – hacking second hand, automatic, quick set date, size, etc. And, it’s a stunner to look at.